RIO GRAND — Classes for the University of Rio Grande and Rio Grande Community College Fall 2017 semester will begin Monday, August 21. New and returning students planning to live on campus will spend the weekend moving into their dorm rooms during Welcome Weekend. Student Engagement Coordinator Seth Lawrence said he is ready to see the students back on campus. “Summers on campus are very quiet without the students. They are the reason we’re here and why we do what we do, so I get really excited when it’s time for them to come back,” Lawrence said. As part of Welcome Weekend, Rio will host a Civic Engagement Day Saturday, August 19 from 1 p.m. to 5 p.m. Students will have the opportunity to help Rio’s Bookstore fill backpacks with school supplies for area children at Grande Central in the Rhodes Student Center. Bookstore Manager David Ding said he feels this is an important way for Rio to give back to the community. Ding said the bookstore has been donating needed school supplies to area schools for several years, but this is the first year for stuffing the backpacks. Another change to the tradition is parents, teachers and students who need the supplies will be able to come directly to Rio to pick up what they need instead of their schools. Civic Engagement Day is the first step of a larger project called #RioActs. Lawrence said this project will consist of several community service projects and events throughout the year. Civic Engagement Day will be Saturday, August 19 in the Grande Central and is open to students, staff, faculty and the community. 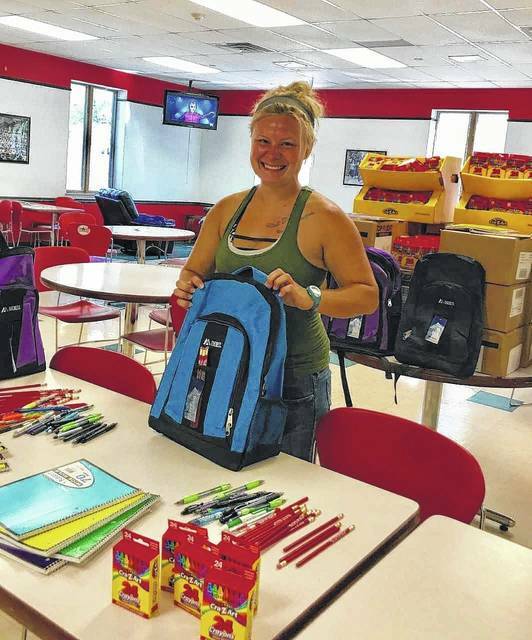 Anyone needing school supplies can come to Rio at the event between 1 p.m. and 5 p.m. in the Grande Central space to pick up one of the backpacks. For more information, contact the Bookstore between 8 a.m. and 5 p.m. at 740-245-7274. Jessica Patterson is a communications specialist with URG.